Not only can this machine deal with any grass or terrain, it will drive itself at a speed nominated by you. 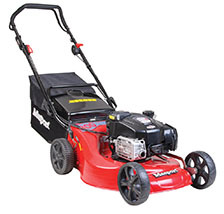 Also features the new Briggs & Stratton InStart™ lithium-ion electric start engine - take the guessing game out of starting your lawn mower, just push the button and start mowing. Blades: Masport Quadcut® 4 Blade Disk System for superior catching due to increased flow.